Chris Magonigal, Revolution assistant director, submitted this photo and caption. 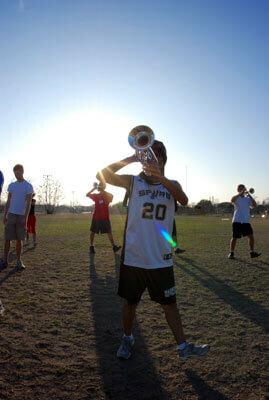 This was taken at Revolution's February rehearsal camp. The sun is already becoming a factor here in Texas and it's only going to get hotter as the summer gets closer. There are a lot of San Antonio kids in this year's group, and they are all supportive of their local NBA champions, the Spurs.